The soil is alive, believe it or not. There are microorganisms, bacteria, and fungi all calling the soil home. 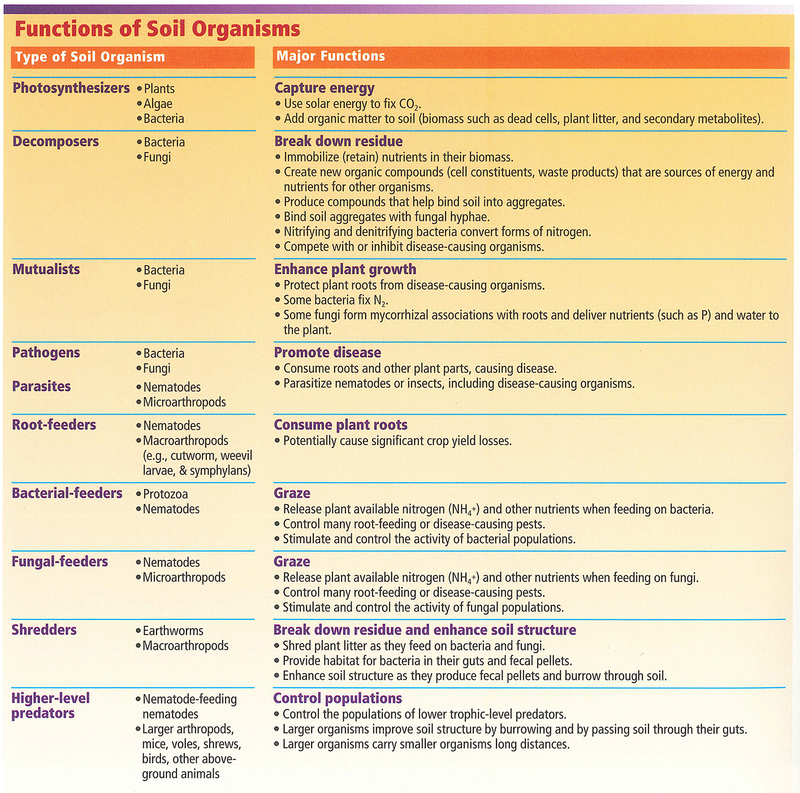 In this lesson, students will explore the biota of the soil to better understand how all the residents work in concert. Students will analyze the soil in order to asses the immense diversity and activity that makes up the soil food web. The soil food web is a tremendously diverse environment and is home to millions – even billions – of hard-working residents, all of whom serve a specific function in the process. Bacteria, algae, fungi, protozoa, nematodes, worms, and small insects are all present in healthy soil. As they exist – eating, secreting, fixing, sequestering – they create the system that makes clean air, proper water flow, and filtered air possible. You see, in the soil food web, every resident does their part to manage the system. Nitrogen fixers, organic matter decomposers, and soil aggregators all call soil home. And their efforts are part of the bigger picture. Nitrogen from the atmosphere is “fixed” in the soil by certain plants and bacteria making it available for other plants. Worms and microorganisms break down decaying organic matter so that the trapped nutrition can be utilized by young sprouts. Fungi help to aggregate soil from a structural standpoint allowing for better aeration and moisture retention. So you see, the soil is a cooperative neighborhood where the residents work together for a common goal – healthy soil that supports life. 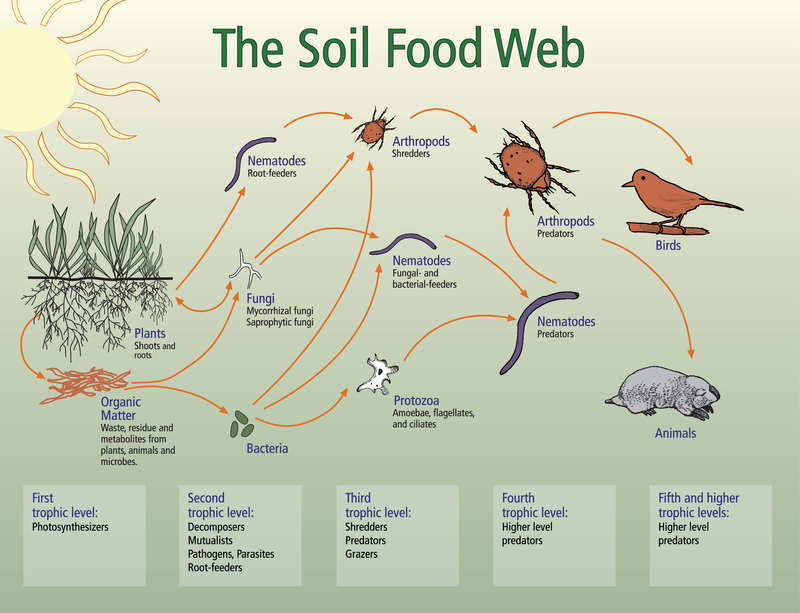 Begin the lesson with an overview of the soil food web concept. Introduce the inhabitants of healthy soil and the role they play in the production of healthy soil. Describe the process in which these soil inhabitants convert organic matter, nitrogen, and the soil structure into the perfect environment for plants to survive and thrive. Break the Students into Groups, each with a microscope. Take a soil sample from the raised planters and view them under the microscope. Look for living proof of a healthy ecosystem. Can the students identify any of the organisms? Have them record each microbe they see using the Soil Microbe Identification sheet. What did you see under the microscope? How many different organisms could you see? What did you not see? Do you think our soil is healthy? By a show of hands, how many of you think that soil is alive? Now that you understand just how much life is in the soil, how many of you could name three organisms that can be found in healthy soil? « Dirt Matters! » Dirt Quiz!